The last week, I spent some time travelling with some friends from home. Our destinations were spread all over Québec. I was excited to see them again. I knew, that Québec offers so much adventures especially during wintertime. The week was an outdoor adventure, filled with city sightseeing, action in the snow, love in the air and the best company with good friends! We kickstarted our journey with a little sightseeing tour at old Québec City and its european charm, which is truly a UNESCO world heritage treasure. In front at the chateau frontenac. We visited the Chateau Frontenac and strolled through the streets with century-old architecture buildings. We stopped high at the Dufferin Terrace, overlooking the St. Lawrence River. With brilliant blue sky and watching the ice making its way down the river, we had a superb start of our travel. We continued with a short visit to a natural site: The Montmorency Falls Park. At the top, we felt the full force of the 83m high fall, which is 30m higher than Niagara Falls. 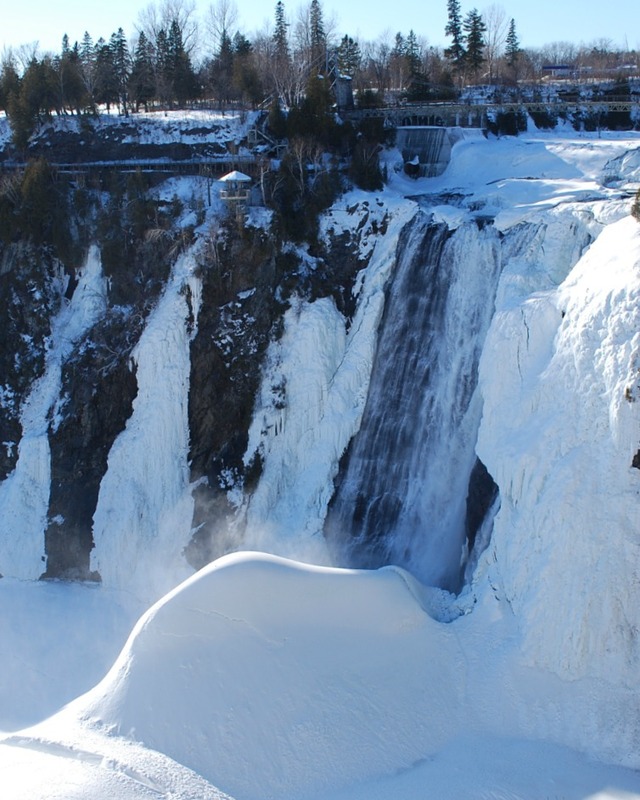 It looks stunning especially in winter, because the spray was frozen at the foot of the falls. Although we did a lot of sightseeing, the first day was rounded off by real work of art made of ice and snow: The Ice Hotel (Hotel de Glace). It’s a place of magic and enchantment, offering crystalline ice sculptures, rooms and suites and huge snow vaults. The Ice Hotel is only open for a few weeks during winter, so we didn’t want to miss our chance to pay it a visit. The next day we woke up early to head north along St. Lawrence river, to spend a full day outdoors at the mountain of “Le Massif“. This mountain is so special, because it offers a spectacular view overlooking the river. We took our sleds and raced down the mountain! On the third day, we packed our bags and went food-shopping, to reach our next destination at Mauricie. But before (and aren’t we all kids) we went to a large winter playground: The Valcartier Village. We all felt engergized, sliding down some of the 35 snow slides or trying the snow rafting. It was so much fun! The next day we woke up at the chalet. Its charming location in the middle of the forest, next to a huge lake (Lac du Missionaire) and no sight of phone reception, it conveys the feeling of a cosy canadian atmosphere. We had all the morning to relax from the action-filled days, reading books and napping next to the fireplace. At lunchtime, we drove an hour north to meet up with our guide for the skidoo-tour. Surely by now, the action came back again! 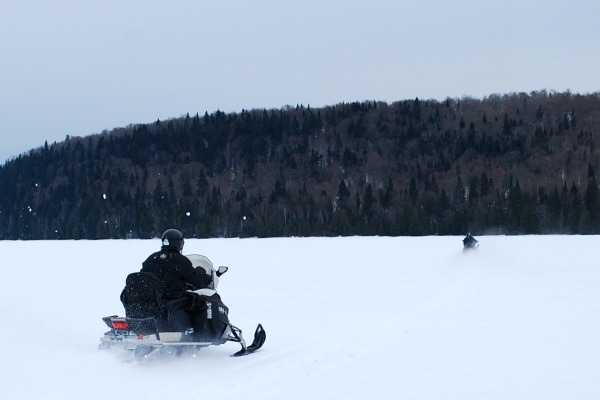 Each of us rented an own snowmobile and so we drove with full power (100 km/h!) through snowy-landscapes, along rivers and over frozen lakes. It reminded me once again, how much I love the winter here! Back at the chalet, we cooked some delicious salmon burgers and with some beer and wine, we enjoyed a cosy and calm evening. After loading our batteries, we woke up early for another highlight of our trip: The dogsleigh tour. While I loved all activities with my friends, dogsledding is a lifetime-experience, which I could do over and over again. I could describe it as a unique feeling between nature, weather, wildlife, and teamwork between human and animal, working towards a common goal: racing through the snow. The anticipation of the dogs is contagious and from the first moment, I feel joyful and motivated to work with them. When we arrived, they knew it is racetime and they all started to bark. Sleddogs whose engery is connected with a deep-rooted passion for hunting, you can really hear, that they can’t wait to run in the snow. The dogs really love it. But before, we had to install the sleds with 8 dogs in front of each. It isn’t an easy choice to pair the dogs, because some can’t get along with others. Luckily our guide knows his dogs very well. Now we all were musher (driver of the sleds) and the dogs consider the musher as a part of the team. The musher has the responsibility to encourage the dogs and to minimise the risk that dogs gets entangled and injured by the sled line. The tour was amazing, although the dogs had difficult conditions through the fresh deep-snow. Along the way, we had to encourage them often and help pushing the sled up some hills. Not only for the dogs, this was an exhausting, but overall great tour. After the tour we drove back to our chalet. Unfortunately the whole region was without electricity that day. On our arrival at the chalet, we recognized that we neither had electricity nor water. 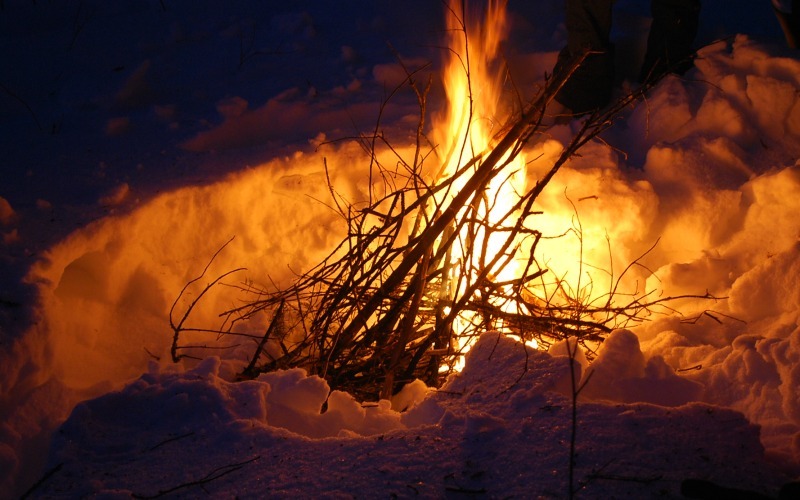 A good reason for our men, to use their survival skills, by digging a hole at the frozen lake (which took about 2 hours) to get some water or by cutting some wood. In the meantime, me and the girls prepared the dinner – homemade pizza. 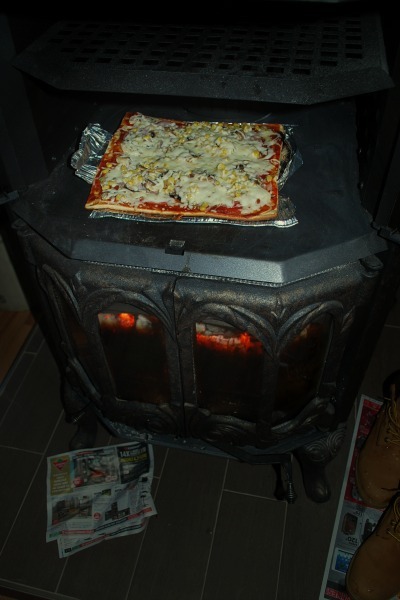 Since 5 hours there wasn’t any sight of electricity, so we decided to bake the pizza in the wood oven. Even if it took quite a time for the first pizza, it tasted delicious. Why should we need electricity, water, mobile phones…?? Ok, maybe there is one exception: Before a wedding on the next day. And here we come to another highlight of our trip: The marriage of my friends Sabrina and Alex. The wedding was planned for the day after, so we (okay, mainly the girls) got a bit nervous about the electricity problem. How to get the hair picture perfect without hairdryer and or ironer? Not to mention the fact that we couldn’t even wash them without water. Doubts and questions came across, but suddenly -after 9 hours – we got light in the chalet! In the morning we all got our 3-min. showers, got dressed really chic and drove out of the forest into the city of Shawinigan, where it all happend. After buying some flowers and a photoshooting at a studio, we went to the court house, so my friends could get their love sealed with rings. Jean-Nick and I felt very honoured to be part of that special moment and witnessed their marriage. It was a great day full of love and I am glad that all the preparations beforehand, worked out very well. With this special moment, the trip was almost coming to an end. After 4-days of nature, the big city life awaited us. The next day we left the chalet to drive to Montréal. This was our last stop, before saying good-bye to our friends. They had 3 days to visit the city, while Jean-Nick and I drove back to our homebase in Abitibi. Waterfall, citytour, dogsleigh, skidoo-tour, chalet-life, marriage, snow-rafting, ice-hotel, laughing, cooking and simply having great time: It all couldn’t have been better! 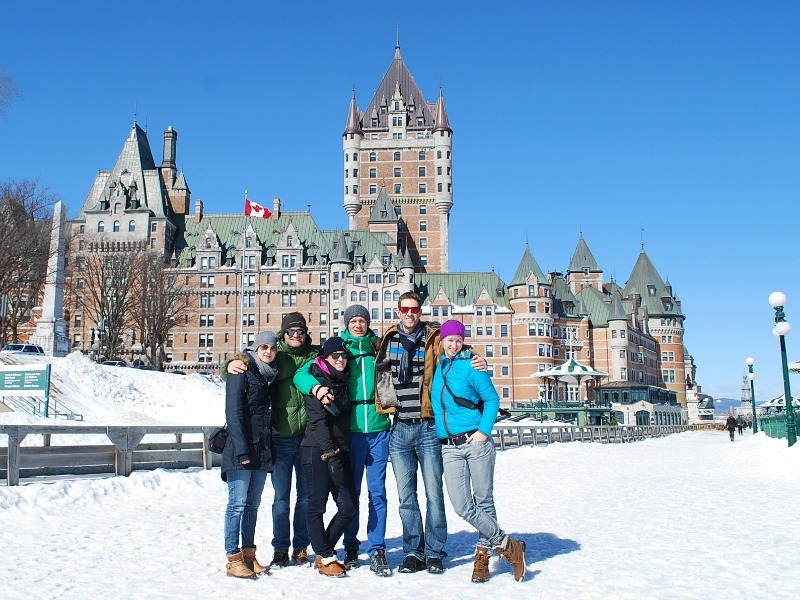 Thank you Sabrina, Magreth, Alex and Peter for an amazing trip with you through Canadas’ winter wonderland. We are happy, that you came over!